I'm considering replacing mine. Has anyone done this, and do you have good tips to share? I'll probably go with acrylic and Dow 795 is the adhesive of choice. But I'm hearing many opinions as to what to use for spacers. Perhaps VHB tape. I think my greatest concern is getting the caulk in the along the bottom; is there enough room for the gun? Also between the panes. Although I'm not replacing the portlights now, I am interested in using Dow 795 to adhere the existing portlights. I have not yet found directions from Dow Corning that describe specs for this use. Casey suggests that the thickness of the VHB tape, 2.3mm or approx 3/32", gives enough space for the sealant. Perhaps that is good enough for a sealant role, but not enough space for a bonding role for the Dow 795? Does the VHB tape defeat the bonding and thermal expansion advantages of the Dow 795? I'm thinking the VHB is closer to 5200 with respect to permanency/replacement. The tape serves as a backer material for the caulk. I like this better than the rubber bumpers that I believe were the original spacers. 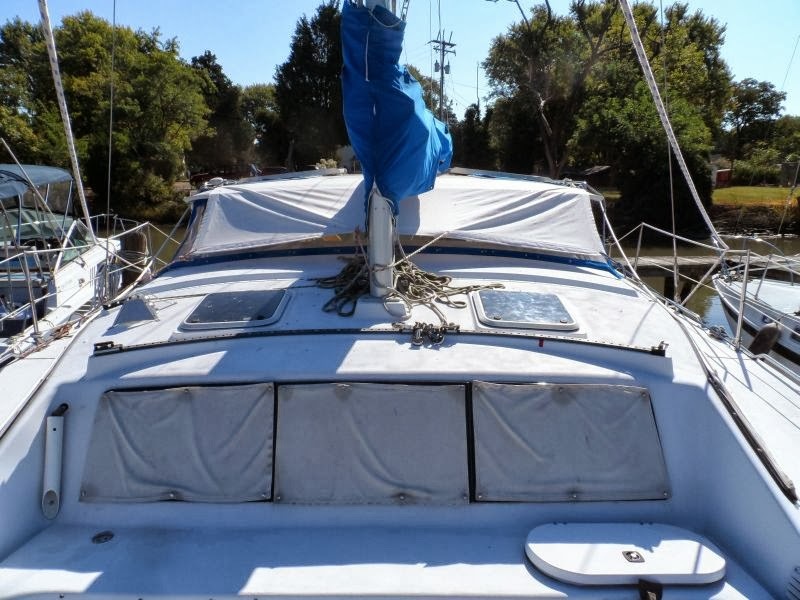 The tape will help ensure that the caulk is optimally located for bonding and edge sealing, as opposed to migrating inward toward the center of the portlight. I'm leaning toward using a UV stabilized tape of TBD dimensions as a backer/spacer, the original screw and trim washers for initial clamping, and Dow 795 with a concave edge treatment. I'd remove the screws after appropriate setup of the caulk and fill the holes with Dow 795. So, I'm interested in feedback, positive and negative. I'd like to know what the optimal spacing to provide bonding of the portlights to the fiberglass is. I did find a neat technique for tweaking the nozzle on the caulking tube in order to better guide the caulk into the tight spaces. Simply cut the nozzle to the needed opening, then crimp the nozzle end with pliers to create a rectangular shaped end that fits between the adjacent portlights and edges. My plan at this point is to take an old broken window I have, position it over a fiberglass blank with several methods, and do a test run! If nothing else, it will make game day more relaxing. Koehlmann suggests "about a 1/4 inch" of space is needed for correct bonding. He has posted several times about using Dow 395 without other adhesives(like VHB tape) with success. Since I'm doing this on old portlights, and it is time (water inside the boat is a bad thing), I'm going with this 1/2" wide by 1/8" thick PVC tape, 76545A17, from McMaster-Carr. I'm invoking the the Iriemon solution and keeping my fingers crossed. However, I will be watching your experiment. I chose that tape for its thickness and weather-resistant properties. I still plan on using the screws and trim washers for initial clamping of the portlights to the fiberglass. If we find out that 1/4" of spacing provides a superior bond, I'll double up the tape and buy some more for the starboard side. I think it says minimum gap and grip are both 1/4". It specifically talks to the much heavier plates on the outside of skyscrapers. Nothing about the lighter lexan applications we have. So, I'm mulling it over and may double up the backing tape on this first attempt. I believe factory bonding is about 1/8". We should look closely. I don't believe there is any history of leaks. Mine have not. Another thing to consider is that PDQ wisely broke the windows up into relatively small units. This will reduce differential expansion. So, you think 1/8" is enough? We've got some evidence to support this. The idea of the spacers is to prevent the goop (a/k/a Dow Corning 795, and nothing else!) from squeezing out too much when you mount the acrylic window to the fiberglass (or whatever material it is) frame. When you screw the new window into the frame, you're going to have some goop ooze out, which is fine to ensure you have a good even layer. But you don't want the layer of goop between the acrylic and the fiberglass to get too thin, in which case it will be less effective as a seal and barrier. You want the barrier of goop to be about 1/8" thick if possible. I don't think you need 1/4" thickness for the goop. I haven't used that thickness before, but strove for the 1/8" thickness range. (Note this is the estimated thickness *after* the window is firmed down to the frame with dried goop.) You're looking for a layer of (dense) rubber-like caulking that you can tighten down on. About 1/8" worked fine for me. But OTOH, I don't see how it would hurt to have a thicker layer of goop (unless you need to get a flush mounting or something like that). If you want to be cautious err on the thicker side of 1/8 - 1/4" you should be fine. For spacers, I've used bits of cut up neoprene from an old wet suit, and the little spacers tile layers use to space tiles. The idea is something that will maintain a space but compress when you screw the window down (after the goop is dry). Both will compress while maintaining a barrier gap for the goop. They will compress further when you snug the window in after the goop has dried. I cut the spacers into little 3/16"-1/4" cubes, and glued them (with a dollop of 795) strategically around the frame (roughly every 8-12" or so). Then apply the goop over the spacers. The goop should surround the spacers -- you don't want the spacers showing through the goop. Mount the window, and tighten it only enough to get the surface even, but you want the window sticking out just a tad from the frame. Let the goop dry a couple days, then you can snug the window in. You should clean out old sealant first, of course. However, I couldn't really clean out all the old crud when I replaced the plastic part of a hatch cover several years ago, so I just dug it out best I could and then filled in the 795, and the damn thing hadn't leaked a drop in years. I didn't even use spacers for the hatch, because there was no mechanical fastener between the plastic and hatch frame. I just pressed the plastic into the frame and evened up the surface. I think after the goop firmed up I put a couple tool boxes on the sides to give it some pressure for the final set. I can't believe how well the 795 works considering Dow says its just a silicone sealant. And also of course make sure you tape everything beforehand. I just used my finger (and a lot of paper towels) to remove the excess goop and get a nice smooth surface. Peel the tape off before the goop sets firm. Last edited by Iriemon on Mon Jun 26, 2017 5:26 pm, edited 1 time in total. Since the PDQ 32 windows have screws, I'm not sure why you'd need or want VHB tape. If you are going with a "screw-less" look on the new acrylic window, them maybe it would make sense to use the tape hold the acrylic to the frame while the 795 is drying. Though if you tape the window frame and then try to use the caulk to "fill in the gaps" you may not be getting a firm seating with the 795. If you're going to use the screws to mount the window, I would just use the 795 as I've described as I've had very good success with just the 795. I've used it to mount overhead acrylic "skylights" to fiberglass on our old Hunter 35, to install a new piece of acrylic to a hatch frame, and to reseal and glue portions of old (and partially corroded) rubber gasket to a glass window on a larger power boat. Every time (when other concoctions failed to last) the 795 worked well and exceeded expectations.